Stroke occurs when a blood vessel feeding the brain is clogged or bursts, causing a sudden disruption in the blood flow to the brain. 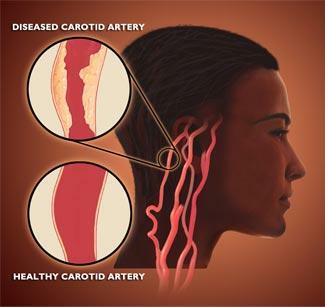 Carotid artery disease is the leading cause of strokes. More than 50% of stroke victims present no warning signs. After the age of 55, the risk of stroke doubles every 10 years. Most significantly, 97% of the adult population cannot name a single warning sign of a stroke. When the carotid arteries become blocked with plaque (atherosclerotic plaque), blood flow to the brain is compromised. InSight Ultrasound Specialists uses painless and non-invasive Doppler Color-flow Ultrasound Technology to provide images of the carotid arteries on both sides of your neck and measure the velocity of the blood flow through these vessels. Based on these observations, a hidden blockage will be detected and allow the screening participant to act on these findings. � Copyright 2005. All Rights Reserved. No part of this site may be reproduced without consent from InSight Ultrasound Specialists, Inc.